Michael Geist points to a recent study conducted in Canada in part by Industry Canada (a federal agency) about music purchasing habits that includes some potentially bad news for the recording industry. According to the results of the The Impact of Music Downloads and P2P File-Sharing on the Purchase of Music: A Study For Industry Canada study, which surveyed over 2,000 Canadians, there is a positive correlation between file downloading over P2P networks and legit purchases of music on compact discs. This might come as a surprise to industry executives who have long complained that peer-to-peer file sharing is immensely damaging to CD sales. According to the study’s authors, there is “a strong positive relationship between P2P file sharing and CD purchasing. That is, among Canadians actually engaged in it, P2P file sharing increases CD purchases.” The study estimated that there is an increase of 0.44 CD purchases per year for every 12 P2P downloads. 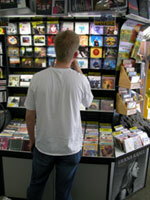 When viewed as a whole, the study found no positive or negative effect on CD purchasing from P2P filesharing in Canada. The study concluded that about half of all P2P downloads were done because users wanted to hear an album before purchasing, or because they did not want all of the songs associated with a particular record. That is something I can relate to. Last week I read a lyric from a group called Blue Scholars in a friend’s Facebook profile that I liked. The artist’s web site only had one song for download, the 20 second clips I could get on music download sites weren’t very satisfying, and being a small, independent group from the other side of the country it is unlikely I’d hear them on the radio. So I hopped on to BitTorrent, downloaded a couple of tracks, gave them a listen and very quickly decided to order the CD from Amazon. Without access to those files over a P2P network, I likely never would have heard that music or purchased the album. I’ve long suspected that many people are likely introduced to new music via P2P networks, and that much of the rest of the music that people download (the stuff they don’t end up liking enough to legitimately buy) they never would have bought in the first place — and thus, the losses by the recording industry are likely vastly overstated. This study appears to confirm at least one of those beliefs. How about you? Have you ever downloaded music over a P2P network? Have you ever been introduced to music that you’ve purchased via peer-to-peer downloads? Will ISPs spoil the online video party? Well said. There’s so much more music consumption going on, it’s crazy… and it’s awesome that people are sharing and discovering so much new music. We’re all participating in the ultimate mix-tape that never ends. Well, until the next big shift in how we interact with music. The labels don’t control the relationship anymore and they just can’t seems to get over that loss and move on. Every move they make is a laughable mistake, ie: suing the very people who want their product now more than ever and oh, let’s talk about recent launch of “the ringle”… so bad. They should be thanking the file sharers instead of hating them. As much as I disagree with the Record Industry and how they conduct their business, I found that over the last 2 years I’ve spent much more money on music as compared to the previous 4 years. For me, it is the vast amount of exposure I receive from from file sharing that has literally created a micro-network composed of like-minded music lovers and a knowledge data base that just could not have been assembled under any other circumstances.